Partly cloudy this morning, then becoming cloudy during the afternoon. A stray shower or thunderstorm is possible. High 73F. Winds SW at 5 to 10 mph..
Mostly cloudy skies this evening will become partly cloudy after midnight. Low 48F. Winds NW at 5 to 10 mph. Hundreds of people gathered at two memorial services Saturday to support victims and one another as they grappled with the impact of the city's second mass shooting in a month. Much of the crowd was at UCCS to support slain campus police officer Garrett Swasey. Colorado Springs Mayor John Suthers told a somber crowd of more than 500 that Friday's mass shooting should not define the city. "This tragedy won't define our community, but the heroism of our first responders and the heroism of Garret Swasey are what defines our community," Suthers said. Swasey's co-pastors at Hope Chapel in Colorado Springs emphasized the officer's devotion for his family and faith. They said Swasey's faith was so strong that he would have wanted everyone to forgive the shooter. At the end of the service, the large crowd gathered in the cold outside around the statue of the UCCS Mountain Lion, which was surrounded by glowing candles. There was a prayer and the song Amazing Grace played before the crowd silently dispersed to small groups crying and hugging one another. Jeanay Angel, who is a resident assistant on the campus and often saw Swasey, could barely contain herself. "He was so happy, he was always so happy," Angel said. "This brings us together and makes us remember that everything we go through we have to be thankful for." Hours earlier at the Unitarian Church there were different reactions to Friday's violence. "Holy smokes. Again. Really?" thought Sara Simon when she heard about Friday's shooting at the Planned Parenthood clinic in Colorado Springs, where a friend of hers works. "Enough is enough. I'm tired of seeing these kinds of things in our town," Simon, a nonprofit professional, said. Disbelief, anger, sadness and vows to stop the violence came from those in attendance. "We're here to honor the lives of those who were killed yesterday in domestic terrorism," said the Rev. Nori Rost, senior minister at All Souls. "We're here to honor the work of Planned Parenthood and stand with them in solidarity. We're here to honor the amazing response of the Colorado Springs police and other responders. But we're mainly here to find comfort in each other's company. Together, we can change the world." Most who attended the prayer service did not know the victims, including James McReavey, a retired law enforcement officer. He lives in the neighborhood where the shooting occurred near Fillmore Street and Centennial Boulevard. "It's getting too close to home," McReavey said. "We need to come together in our community to show our concern and grief and help influence a change of consciousness among the people." The church was overflowing with attendees, some crying and many looking for solace. 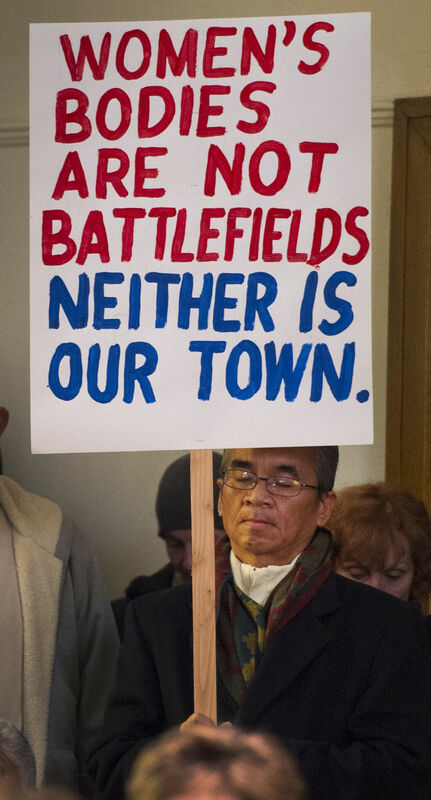 In one corner of the sanctuary, former Colorado State Rep. Dennis Apuan of Colorado Springs held a sign that said, "Women's bodies are not battlefields, neither is our town." "It's a time to come together to recognize some of the problems we're having with violence in our community and instead of being divided, be united," said Jennifer Basta, a member of All Souls who was arranging a table where participants could write notes to the victims' families. The event turned political after Vicki Cowart, president and chief executive officer of Planned Parenthood of the Rocky Mountains, emphasized supporting women's reproductive rights and others spoke of a need for stricter gun laws. That led one member of the audience to stand up and announce she was leaving, saying, "I thought we were here to grieve and mourn and not make political statements." Rost said that was the purpose of the gathering, but added, "It's important to remember the people who face harm's way every day because of the obscene access we have to assault weapons in this community. If we do not recognize something must be done, then we have fallen short in honoring the lives of those who have been lost." Harrison High School graduate Leslie Herod, who is running for a Colorado House District 8 seat, said she was dropping her mother off at the Veterans Affairs clinic near Planned Parenthood on Friday when she realized there was an active-shooter situation. She and her mother left the area unharmed but not unaffected. "This will not be our new normal," she told vigil attendees. "Domestic terrorism will not take hold, not here, and not on our watch. We will continue to fight."